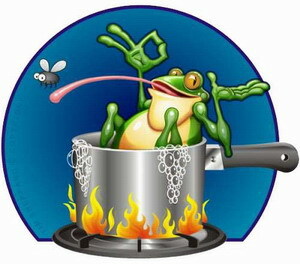 Is The DOE Boiling The Frog? The U.S. Department of Energy’s Energy Information Administration is raising its estimates of future energy consumption. But it isn’t announcing the rises to us. I’ve been writing for some time that their estimates seem far too low. In 2011 the EIA projected global energy consumption would amount to 721 quads in 2030. At the time I was upset because my projections showed a total of about 921 quads. Their 2013 International Energy Outlook now shows a projected energy consumption of 729.2 quads for 2030. As energy consumption is already surpassing their previous estimates, this is only natural. But they don’t seem to be mentioning the increase in any of their publications. Worse yet, in my opinion, is that they are not raising their projections by enough. Their 2011 estimate for 2012 was 519 quads. Their 2013 estimate for 2012 was 540.3 quads. So their adjusted projected rise of 8 quads for the period ending in 2030 has already been exceeded by a real rise of 21 quads in 2012. Energy consumption is growing pretty much in line with my estimates, not theirs. If they continue to just nudge the figures up in every edition of the International Energy Outlook they will be doing the world a disservice. Planners and politicians worldwide use their product to make important decisions. If they continue modest adjustments without notifying us, we will be like the frog in a pot of water warming up to the boiling point. If we need to speed up our adaptation and mitigation efforts it is their responsibility to inform us. Models are not perfect and the world changes in strange ways. Correcting your estimates on a bi-annual basis is a very good thing. But the DOE should be telling people that energy growth is happening faster than they previously thought.